We’re celebrating some indie author publishing milestones around here. 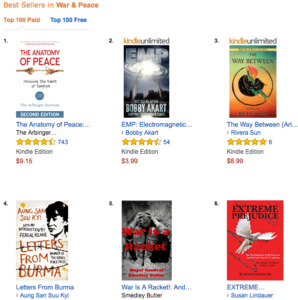 Steam Drills hit #1 ebook in two of its categories and The Way Between topped the charts of the War & Peace category, besting out Smedley Butler’s War Is A Racket to become #3. Celebrate by sending a 99 cent Steam Drills ebook to your friends today! (Tomorrow, it goes up slightly all through our Countdown discount week.) Hip Hip Hooray!